Customize your club's public website and show your viewers your club identity. Begin by adding your club logo to the heading of your public website. 2. 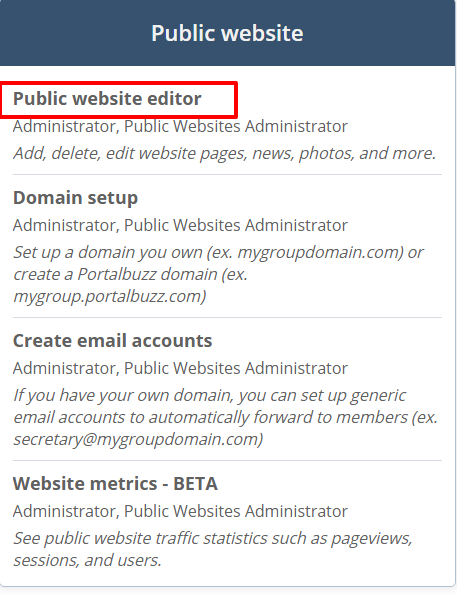 Under Public website select Public Website Editor. 3. Locate Adjust template and click the Select button. 4. Scroll down to Page Header Look. Check the Change Page Header Look box. 5. Next, click the Choose File button and select the image that you would like to use for the header. If you need to adjust the size of the image, do so in an image editor. A free and easy to use editor is pixlr.com. Once adjusted save the image to your computer and then repeat this step to upload your image. 6. If you would like to add text to the header, click in the Customer Text 2 box and type the text for your heading. You can edit the text by using the edit buttons above the text box. 7. Click the Save Adjustments button at the bottom of the page to save changes.